ECDPM. 2013. 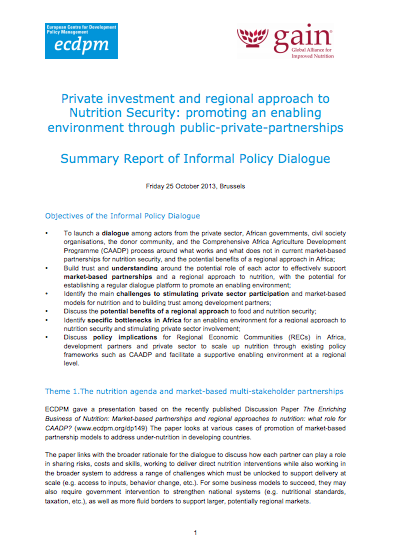 Private investment and regional approach to Nutrition Security: promoting an enabling environment through public-private-partnerships. Summary Report of Informal Policy Dialogue. Maastricht: ECDPM. 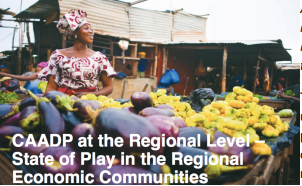 Discuss policy implications for Regional Economic Communities (RECs) in Africa, development partners and private sector to scale up nutrition through existing policy frameworks such as CAADP and facilitate a supportive enabling environment at a regional level. The nutrition agenda and market-based multi-stakeholder partnerships ECDPM gave a presentation based on the recently published Discussion Paper ‘The Enriching Business of Nutrition: Market-based partnerships and regional approaches to nutrition: what role for CAADP?’ The paper looks at various cases of promotion of market-based partnership models to address under-nutrition in developing countries. The paper links with the broader rationale for the dialogue to discuss how each partner can play a role in sharing risks, costs and skills, working to deliver direct nutrition interventions while also working in the broader system to address a range of challenges which must be unlocked to support delivery at scale (e.g. access to inputs, behavior change, etc.). For some business models to succeed, they may also require government intervention to strengthen national systems (e.g. nutritional standards, taxation, etc. ), as well as more fluid borders to support larger, potentially regional markets. Availability, Access, Awareness and Affordability underscore Base of the Pyramid (BoP) business for development approaches. This combination of issues means that effective nutrition interventions must address a complex web of supply, demand and delivery infrastructure to be impactful, scalable and sustainable. Moreover, each issue (e.g. awareness) comes with its own set of stakeholders, regulations and incentives which must be aligned to succeed. For these reasons, addressing under-nutrition requires strong business models, multiple and diverse stakeholders, physical infrastructure, supportive policy environments, informed consumers, financial systems, and good governance. Public and private sector cooperation is therefore integral to any successful nutrition programme. Against this backdrop participants acknowledged the complexity of tackling under-nutrition (unlike hygiene for example) because it involves a multitude of other sectors (e.g. health, agriculture, water and sanitation, transport, infrastructure, education, gender etc.). When measuring malnutrition, further complexities are revealed such as both under- and over-nourished populations within the same country (at times even within the same household). Participants also alluded to the paradox within the nutrition sector of it being simultaneously over-regulated in ways that hinder wider access to nutritional food and under-regulated in terms of establishing nutritional minimum content, for example. Likewise the scientific agenda was mentioned as being both over and under directed. The nutrition agenda is fragmented with numerous and conflicting positions, actors and approaches that further conflate sectoral coordination difficulties. For example, participants debated the merits of focusing on a fortification agenda vs. producing more nutritious foods sustainably. There is a tendency to fight for one approach or the other because nutrition is such a polarizing issue. Both approaches may be necessary to nourish populations now as sustainable food systems and inclusive business approaches for nutrition are strengthened for the future. To coordinate these disparate views and actors at a national level, the mandate for addressing nutrition should ideally be at a high-level office that can bring all of the sectors to the table. This is the case in Tanzania where nutrition falls within the mandate of the Office of the Prime Minister. However, in many countries nutrition is confined to one of the line ministries (often the Ministry of Health) where it does not always get the visibility, resources and political commitment it requires. Participants agreed that elevating nutrition to the political level is important and substantiates Tanzania’s success in recent years to improve nutrition for its citizens. Addressing malnutrition through market-based approaches requires both demand and supply side approaches, not forgetting the BoP consumer is also a BoP producer. This type of approach was stated as key to this discussion in order to include the broader perspective of supporting livelihoods all along the value chain. Discussion also focused on the need to move nutrition from the Corporate Social Responsibility (CSR) portfolio of business to its core-business dealings. Global companies such as Royal DSM, with nutrition as a central pillar of their business, discuss malnutrition at very high levels of the management hierarchy. In this case nutrition is not addressed as a part of corporate relations but as a key element for research and business. As such, amongst many other partnerships the company has developed a strong, long-standing working relationship with WFP for a nutrition improvement programme. Participants stated the need for a change in mentality of businesses, donors, civil society, national governments and the UN family to move beyond small-scale country-level pilot initiatives to regional and value chain approaches. Participants agreed that this cannot be sustained by a single actor or sector but requires support from international and national governments, business, civil society, donors and research institutes. An example that has demonstrated initial success in cross-sectoral partnership is the Amsterdam Initiative against Malnutrition (AIM). GAIN had its business alliance meeting in Amsterdam with Dutch business and knowledge institutes for malnutrition and they just started to ask ‘what can we do together?’. The group developed a brief one-page outline stating what they collectively wanted to achieve to address malnutrition in developing countries and defined who else was important to achieve their common goals. By taking a complex issue and a wide range of partners and focusing them on a simple shared statement of purpose, AIM was able to solidify its role as a partnership platform. This partnership was built around the principle of the ‘Dutch Diamond’ (i.e. organisations from public, private, civil society and knowledge institutions make up the four sides of the diamond). Under the AIM initiative there are many diverse actors and different projects that often are not related to each other. This reinforces the need to cross-learn and keep all informed. However, more time is still needed to see what are the outcomes of the projects this approach has helped incubate. The discussion included issues of trust and credibility among diverse actors with different and often conflicting mandates and motives. In the case of the private sector, the profit-making motive can cause problems for partnerships with donors or government who are suspicious that profit making cannot coincide with social impact. Successful examples of partnerships driven from core business exist, but that does not allay the suspicions of some. One area where almost all public sector actors welcome business engagement is through corporate social responsibility initiatives (CSR), but these types of partnerships are usually short lived because business leaders often need a lot of convincing to integrate CSR activities into core company strategy. Ethical considerations featured in the discussion as absolutely critical to address for cross-sectoral partnership. Participants raised the need to prevent companies from creating demand in the market based on incorrect/incomplete information. Reference was made to such cases in the past (cf. promotion of baby formula) that guide the perceptions of suspicion towards private sector. When discussing partnership for nutrition, more clarification is needed on the rules of engagement between private sector and public sector to avoid conflict of interest. The SUN Movement has started such a process to address issues of conflict of interest within cross-sectoral partnerships. The timeframe for developing strong cross-sectoral partnerships was highlighted as an obstacle for action as these can take time and considerable effort. Participants also highlighted the importance of not only combining/negotiating financial resources in these partnerships but also the exchange of expertise across partner organisations and sectors. Traditional business models also present obstacles for building partnerships. Often profit margins are diluted when expanding out to other markets with more people (BoP groups). Participants discussed the need to develop different business models and cost structures for business to adapt to different needs. A significant hurdle identified in discussion is the lack of ownership taken by national actors for addressing malnutrition. The SUN Movement has made great strides in empowering governments to develop national nutrition strategies, and 43 countries have now joined, but there is much work to do to turn this government commitment into nutrition impact. After all actors agree on the urgency and need to address these issues, the processes can be accelerated to partner for multi-sectoral responses. The public and private sectors need a common language in order to improve cross-sectoral dialogue. In order to bring governments on board, political and economic language is important – using for example ‘big dollar figures’ to get political commitment to invest in the preventative action against malnutrition as opposed to more costly health interventions for diseases as a result of poor nutrition. This type of investment is particularly relevant to nutrition, as someone often does not have outward symptoms of malnutrition or nutrition. Likewise, when working with farmers, politicians, businesses and economists it is important to speak in simple language and avoid complex jargon and to keep the message brief and to the point. On communication and language, participants also highlighted the need to change from the negative framing of messages (i.e. micro/macronutrient insufficiency causing stunting and poor development) to positive messages of what foods and practices support good health and the benefits that can be reaped, even at a national budget level. Participants identified a disconnection within the development sector at international and local levels. The example cited was that of the upcoming Second International Conference on Nutrition (ICN2) which in initial formulations has little mention of the private sector despite work in countries to try take an integrated agri-business approach and work with private firms to address under-nutrition. Food security and nutrition are not sufficiently linked when designing and implementing programmes. Also, farmers are not sufficiently involved in nutrition programmes from the start and the related programmes of land and climate change should also feature within the nutrition agenda. Participants discussed that without acknowledging the multifaceted challenges to the agricultural sector, the nutrition agenda cannot move forward. Discussion also focused on whether it matters if companies move malnutrition work from CSR to core business; it’s an important start to forge these partnerships. However, what will count in the end is who the business or company sends to the meeting table. The chief purchasing officer is more important than the CSR expert if the business strategy will meaningfully become more resilient to shocks (such as climate change induced drought or flood, economic crisis etc.). A question was raised of how to keep the public good close to the value chain. How do different actors hold companies accountable to address multi-faceted aspects of water, land and climate change when operating in the food and nutrition security sector? Businesses and companies need to commit to work to address these issues, the same way governments need to commit. Participants agreed that to make a start, PPPs should keep their initiatives simple. There are opportunities within PPPs to balance the skills and effective management for the multi-dimensional approach necessary for nutrition. Participants stated that the best time to engage all sectors is at the stage of a stakeholder analysis before starting a project. It was agreed this is a better approach than conducting more research into what makes partnerships work when the time has come to take action through existing processes and platforms. Opportunities exist for greater investment into market research in Africa especially in light of recent findings that approximately 90% of food is bought at the markets and open markets (and not in formal sector shops) so there is a greater need to identify how to reach consumers and producers. Participants from MNCs highlighted that their organisations need and can access the deeper understanding of local dynamics/realities through partnerships with agencies and CSOs, and need to work with the UN, communities and public institutions. A potential role for the UN family and donors is to support different sectors with targeted training programmes for nutrition. A key role identified for the EU is to coordinate among the donor governments of Europe to determine the comparative advantage of each for addressing malnutrition in the developing world. Following this coordination, participants discussed the importance of the role of the EC to be an active stakeholder for aligning actions and frameworks in cross-sectoral platforms. One of the main benefits of working with governments is that the machinery for education and awareness works faster across all levels as is the case in Tanzania where the government recognised the savings on investment in nutrition and food fortification as opposed to disease case management. As a result, the health human resource structure was updated to include a nutritionist at district clinics to raise awareness on the importance of good nutrition and as such the demand for these services and nutritious foods has increased. With this demand creation, the private sector is attracted to work with informal local food processing plants and make other investments. A common goal for PPPs should be women, infant and young child nutrition as outlined by the focus of global nutrition movements on the first 1000 days (from conception to the child’s second birthday). Goals set to achieve infant and young child nutrition should come first, followed by defining the role of each sector and then the design of actions can be clearly outlined (including links to CAADP and other frameworks). Discussion also focused on the importance of incorporating women’s economic empowerment, especially in the agriculture sector in Africa where women play a major role, into trade and value chains. Because different countries are at different stages to implement CAADP it is important to include women farmers and for nutrition it is vital to include women because they are responsible for household nutrition. AIM is working with SPAR supermarket chains in South Africa and local farmers to improve links of producers, retailers and consumers by linking small farmers to nearby larger retailers so that consumers more easily access local produce. Products also become more affordable because of reduced transport costs and produce is fresher and more nutritious because of proximity to market. The KeBAL Street Project in Jakarta is a partnership between the international NGO, Mercy Corps, Royal DSM and the Rabobank Foundation. The model is a franchise business model based on selling nutritious food through two central cooking centres, where micronutrients from Royal DSM are mixed during food preparation, and 22 vending carts run by local street vendors where the food is sold. A plan is in place to make this project sustainable so that it can run without third partner support. A cold chain project in Ethiopia illustrates the importance of infrastructure along the cooling chain to prevent spoilt food, and in this case milk. Local businesses had the money to purchase the cooling system but not the innovation, so a Dutch company and Dutch research institution designed a milk cooling chain with 50% investment from both partners in the Netherlands and Ethiopia. Since the initial phase, the demand for the cooling system in Ethiopia is very high from other local businesses. RijkZwaan and Afrisem project in Tanzania works closely with local famers to ask what kind of crops they want enhanced. The Dutch company has taken the long-term view and does not plan to make a big profit from this work for the next ten years. It is building the project through an inclusive market approach and growing the margins for their products in the future. An AIM project on fortified dairy (milk and yoghurt) in Ethiopia in partnership with DSM illustrates the case for focusing on small-scale private businesses as preferred partners to increase the market share for products targeting lower income groups. The need for a regional approach was highlighted in terms of expanding geographical reach of projects and businesses in the nutrition sector in Africa as well as in terms of the regulatory environment presenting challenges to trade across borders. Countries seek to protect their local markets but if a regional approach to tackling under-nutrition is to be realised, the highly regulated trade of agricultural and related goods needs to be lightened or at least better harmonised. From a global or regional perspective, import and export bans are arbitrarily applied on different goods for different countries, presenting serious challenges for procuring food in time of crisis. A haphazard a regulatory terrain also makes it difficult for local businesses promoting nutrition to procure innovative and cost-effective technologies such as cooling chain technologies. Participants also referred to challenges of tax for example of fortified foods (even to import the raw vitamin materials and blend in-country is also heavily taxed) along with special packaging required to safely store these goods. Discussion also focused on the need to link the regional approach to improving infrastructure or links made with the existing infrastructure of other sectors such as health and agriculture. An example of regional logistical challenges for nutrition is the transport of horticultural technologies and vegetables a project in neighbouring Rwanda by air from South Africa rather than sourcing in the region, e.g. Kenya. Discussion revealed that cross-sectoral and regional partnerships need to involve regional bodies such as the Regional Economic Community Secretariats (SADC, COMESA, ECOWAS, etc. ), customs unions, common market initiatives and other regional focused bodies supporting trade and regional integration for nutrition, agriculture, trade, transport etc. GAIN opened the session by reflecting on the importance of accessing markets and infrastructure development in the broader view of economic growth and development. It is important to prevent the creation of parallel systems for development and strengthen communication to governments about where business wants to invest so that the public systems and capacities can be built by the state for their citizens in those areas. Conversely, the private sector needs to learn how public processes and investments work. This is described as a win-win of PPPs and underscores the importance of an enabling environment for private investment through improved evidence, tax structure, infrastructure and jointly lowering risk. CAADP offers a framework to maximise the development benefits from these public-private partnership models and is supportive of an enabling environment for regional agricultural trade. There are clear overlaps with the SUN network of 43 countries (11 from Africa) to analyse country plans and entry points for nutrition partnership. They have focal persons in Planning Ministries and Health Ministries (junior and senior staff). In terms of addressing the overlaps between the agriculture and nutrition agendas, the discussion focused on ways to maximise on the linkages between the CAADP and SUN frameworks and where there are insufficient links, these should be supported through further dialogue, research and action to get a clear roadmap for alignment. Another aspect for the attention of policy makers is food preference and cultural issues when it comes to local food choices and production schemes. For example, in Kenya it is not common for people to eat cassava or fish. For this reason, sustainability of agricultural projects funding aquaculture or cassava production should be considered because local markets will not typically sustain the sale of those products. The same can be said for matching food preferences in times of emergencies because people will distrust food that they think is unsafe because of colour etc. Participants agreed that the agricultural sector must incorporate nutrition-sensitive interventions starting from the policy level. There was consensus from African stakeholders that food and nutrition security can only be improved by engaging private sector (including small-scale producers) because governments are not producing, distributing and selling food. 1. 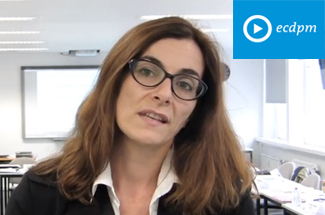 What can Governments do to support technology transfer from MNCs to SMEs? 2. What can be done to bring other sectors of transport and logistics, telecommunications, education and others into the nutrition agenda? 3. 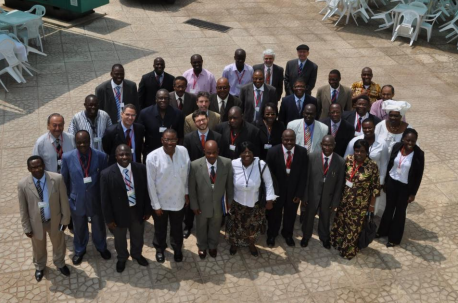 How can the CAADP processes engage SUN focal persons in different countries? 4. How can we get civil society and donors involved so that they share the risks of investment in business for development/BoP initiatives? 2014 is the AU Year of Food and Nutrition Security and presents opportunities for building momentum and awareness. an analysis on the potential benefits of a regional approach to Nutrition in Africa, the current obstacles and analysis of the regulatory environment, with an initial focus on one Regional Economic Community. GAIN and ECDPM are committed to continue facilitating informal and frank dialogues and are keen on collaborating with other participants (and beyond) to explore ways to undertake such suggested short to medium term work.